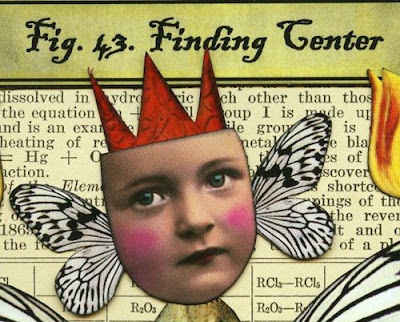 This week's Crowabout collage challenge had quite a few circus images. Since this is my third circus-themed collage in as many weeks, it looks as though I've got a series! I didn't plan to do another circus collage . . . it just happened to work out this way! The large, center image is from Dover Publications. Approximately seven of the Crowabout images were used; however, most of them have been altered in size and/or color. (For example, the red, orange and green striped border began as a red and white piece.) 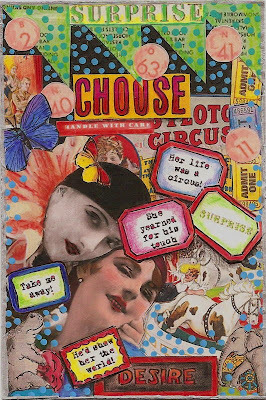 Additionally, you may recognize some things from my two previous circus collages: A mixture of pieces from Dover, past Crowabout challenges and my own scanned images. The entire collage was created on a black-gessoed piece of recycled chipboard. All of the images were hand cut and colored with watercolors and Prismacolor pencils. Pitt pens and a blue poster paint pen were used for accents; and the entire piece was edged with silver marker. 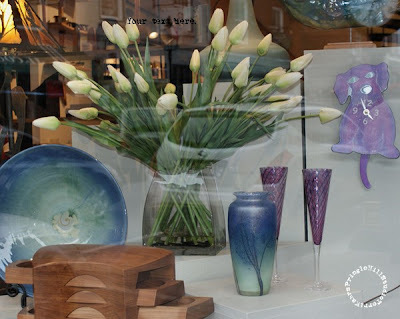 When you have a moment, take some time to stop by Peggy's blog to see her work. I particularly love her awesome collages! 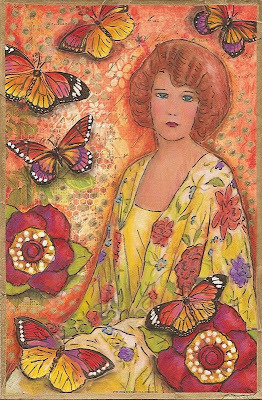 "Butterfly Garden" was created for this week's Sunday Postcard Art Challenge - the theme this week is "butterflies". The lovely lady is from a FLICKR photo sharing group; a special "thank you" to "paben" for this lovely lady. Her embroidered robe was enhanced with watercolors, Prismacolor pencils, acrylic inks and Twinkling H2Os. Her skin and hair were colored with Prismacolors, watercolors and pan pastels. All of the butterflies were taken from Dover Publications. They, too, were hand colored using the above-mentioned methods. The two large flowers are digital downloads from scrapgirls.com. They were printed in a photo editing program and hand colored with watercolors and Prismacolor pencils. Charcoal pencil was used to apply the shadows; after it was applied it was lightly "smudged". All of the images were mounted on a piece of scrapbook paper from S&K Company that was dry mounted to a 4"x6" piece of chipboard. Edging was applied with gold marker. 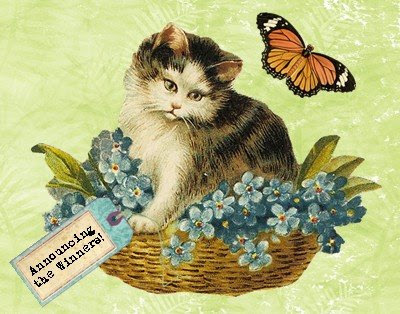 Wishing everyone a very happy spring weekend! The daffodils and magnolias are finally in bloom. Looks like winter is finally over, and I want to dance through the tulips! 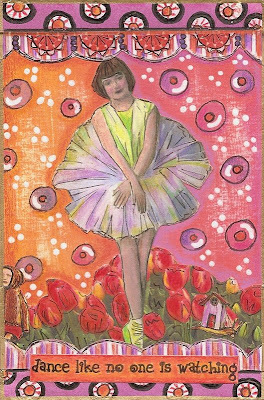 This little ballerina is taking a moment to gather a deep breath before she begins to dance through the cheery red tulips too! She's slightly timid, but all she needs is a bit of encouragement to dance her toe shoes (and the flowers) into shreds!!! I'd love to give credit for this image; however, I honestly can't remember the source. She's been in my vintage collection for a long time. Her pretty tutu has been enhanced with watercolors followed by a layer of Prismacolor pencils. The background was created using watercolor crayons mixed with gesso. After the initial treatment was dry, it was lightly sanded for a timeworn look. The circle borders were painted with acrylics, and the scalloped borders (from a Crowabout challenge) were hand-colored with Prismacolors. The tulips were cut out of a magazine, and the remaining, tiny images (recycled from a brochure) were scanned and "shrunk" in a photo imaging program. Do something just for YOU today, and have a happy weekend! Sometimes you just can't resist a good challenge! With my husband out of town for a few days, I've had extra time to play in the studio and can participate in a few challenges this week. This is my very first entry in the Sunday Postcard Art challenge - the theme is "Pierrot". And, since I used some of the images from this week's Crowabout challenge, I've met that challenge's requirements too! The Pierrot couple, as well as the horse riding people in the background, are from a FLICKR photo-sharing group. Approximately nine of the Crowabout images were used - including all of the little "labels". They were sized and "texted" (Is that a word?!?) in a photo-editing program, and then hand-colored with watercolors and Prismacolor pencils. Other graphics include images from previous Crowabout challenges and scanned circus scrapbook stickers manipulated (for size only) in a photo-editing program. As a final touch, blue paint dots were added to the background, and the entire piece was "edged" with a silver marker. 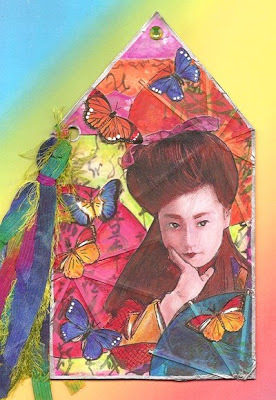 "Madame Butterfly" is a shaped journal page created for this week's Dans ma Maison il y a l'Orient challenge. The image of the geisha (from the public domain) is mounted on a piece of gessoed, recycled chipboard from a cereal box that's been covered in assorted pieces of scrap paper. Ms. Butterfly is surrounded by paper parasols from the party store and butterflies from Dover Publications. She, as well as her surroundings, have been enhanced with watercolor pencils, Prismacolor pencils and acrylic paints. The tassel was made from assorted pieces of decorative fiber. A citrine-colored jewel adorns the tip of the roof, and silver marker was used to enhance the edges. Please Help JoAnnA & Ron! Beautiful, wonderful Isabella from Creative Souls, has started spreading the word throughout the artistic community to help raise the necessary funds for Ron's medical needs. Please . . . if you can contribute any amount to this fund to help defray the cost, it would be greatly appreciated. It truly doesn't matter if it's $1 or $1,000. And, if you'd like to post a "counter" on your page to help the cause, please click here for the particulars. I humbly, and deeply, thank you for your generosity and kindness. My sweet granddaughter, Katharine, celebrated her 1oth birthday yesterday! As in most families, birthday's are always a huge deal. The Birthday Celebrant is always treated like a king or queen. Among the privileges, certain exceptions to chores are granted; and, of course, favorite foods and presents are always part of the celebration. What did Katharine want as her special birthday gift? She wanted her ears pierced! Mom, being the great mother that she is, told Katharine to wait until she was 10; and yesterday was the day! Through the wonders of technology, Mom (in Maine) sent pictures through her IPhone of the memorable event. (You gotta LOVE technology!) The initial pictures showed a group of ten year-old's huddled together in fear and apprehension, followed by a close-up shot of Katharine's soon-to-be-pierced little lobe. Then, voila . . .THE picture of Katharine and her friend, Sarah, wearing pretty, little stud earrings! But the picture I love most of all, was the last one of Katharine and three of her closest friends happily enjoying celebratory ice cream treats in a small, local cafe afterward! 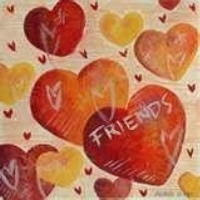 The gift of "friendship" . . .That's SO what it's all about isn't it?!?! Katharine's little group was supportive and celebratory. They were there for each other and for her. 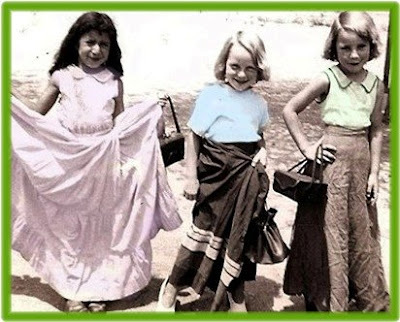 Women, young and old, form common bonds and forge the most wonderful friendships! Friends that'll stick up for you and hang in with you through good, bad, right and/or wrong. Friends that'll hand you a tissue when you need it, give you support to see you through difficult times, and offer encouragement when your self-esteem has hit new lows. Friends that'll laugh and cry and jump up and down to celebrate your success - no matter how large or small. Friends who sometimes stay in the shadows, but they are always there - like guardian angels - to lift you up with their sweet words when you need love and hugs the most. This has been a week of seeing the many facets of "friendship" at their very best. Huge hugs to each of my friends, old and new. And . . . a toast to technology for making wonderful, new friendships possible! Have a super weekend, my friends!!!! "Madonna of Spring" was created for this week's dans ma maison challenge, "There is Spring" (il y a le printemps). The serene Madonna, holding a symbolic lamb, is an image from a FLICKR Crowabout collage sheet. Generally I tend to shy away from yellow; however, I decided to use it liberally in this piece as a nod to my favorite spring flower, the daffodil. The flowers and bird are from Dover. Her little house was created from a recycled, gessoed cereal box. Acrylic washes of yellow acrylic paint and watercolors were applied over a layer of modeling paste. Other materials include Prismacolor pencils, watercolor pencils, pastels and Pitt pens. The edges were defined with gold marker. Multi-colored fibers and "jewels" embellish the roof. 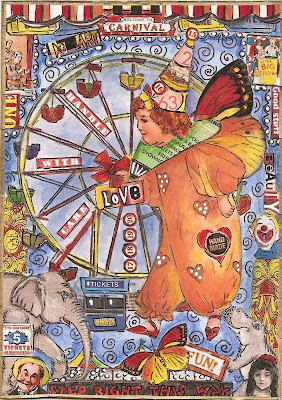 "Carnival of Love" was created for my FLICKR Crowabout Group and has been posted as a tribute to all members (past, present and future) of the Sisterhood of Hats & Wings! I've used wings in some of my previous pieces; however, I realized that I've never, ever used a pointed hat - and honestly, I don't know why!!! Well . . . today's the day to spread my fantasy wings in support of the wonderful Sisterhood! 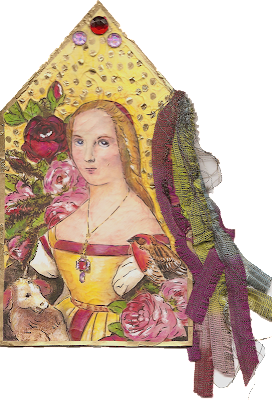 This collage has been mounted on a piece of gessoed chipboard, and eight of Nancy's Crowabout images were used. Photo imaging software was used to size some of the supplied images. 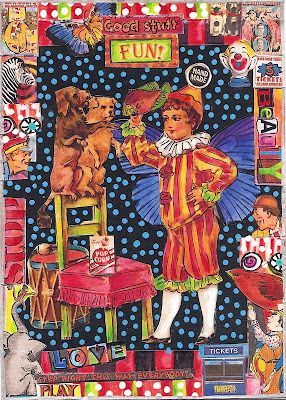 The little clown is from a FLICKR image sharing group; and some of the circus ephemera was scanned from scrapbook stickers then altered with paint and Prismacolor pencils. Twinkling H2O's were used to give the clown and the sky a subtle shimmer (although the scanner doesn't pick up the sheen). The orange and red striped border (at the top) was hand drawn and hand colored. 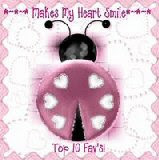 A very special thanks to Nancy Baumiller who administers the FLICKR Crowabout Group!!! Nancy's colorful "Giveaway" packaged arrived late yesterday chuck full of fun goodies! (I was the lucky winner of her anniversary celebration giveaway a few weeks ago.) Thanks, dear Nancy, for your generosity!!! I LOVE the artwork, and the stamps, and the stencil, and the stickers . . . . . I love it ALL!!!! The piece of "Police Line Do Not Cross" tape is one of my faves! (I'm saving it to use in my son's bedroom when it reaches the critical mass/mess stage!) If you'd like to have fun, check out Nancy's blog, her Etsy and the Crowabout Group! Thanks again, Nancy! 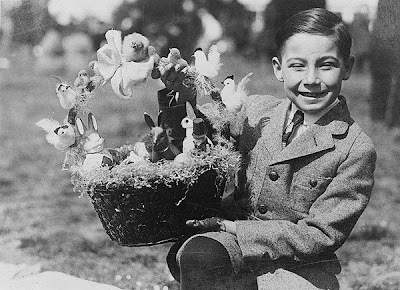 Hope you're all had a wonderful (and hopefully, relaxed) Easter weekend! 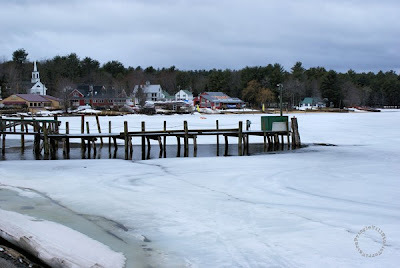 Here are more pictures from our recent trip to Maine. 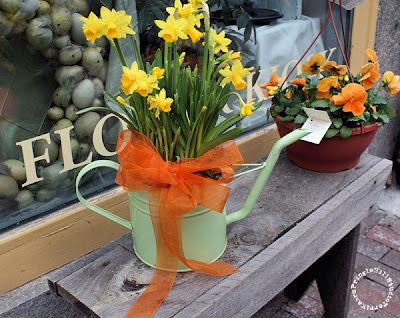 Hope you can take a moment to make a cup of tea and go on virtual tour of New England. (Wear a virtual coat 'cuz it was c-o-l-d!) If you'd like a closer look, just click on each of the pictures, and they'll open in a larger view. 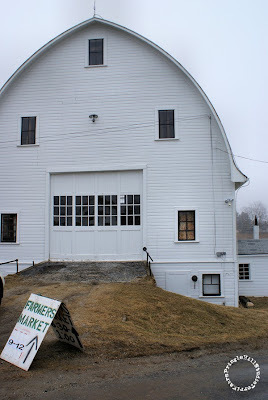 While we were staying in Brunswick with our daughter, we visited a farmers market that's held in the basement of his barn during the winter season. Bought some local honey and fresh baked brownies! What fun! After spending the weekend with the kids, we decided to meander home through New Hampshire and Vermont. Here are some of the sights along the way. So pretty and SO cold! The is such a typical New England shot. I love the way the towns form along the lines of the bay. These shots were taken on our way to Mt. 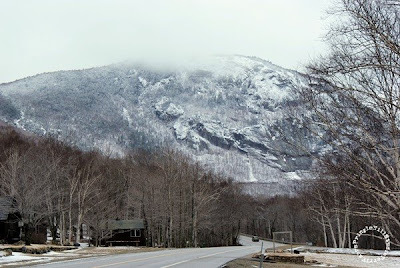 Washington, NH - the highest mountain east of the Mississippi. 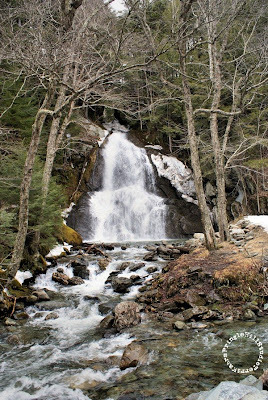 The snow melt filled the streams with crystal clear water. Although it was snowing off and on, it was beautiful! These pictures don't do justice to Mother Nature. 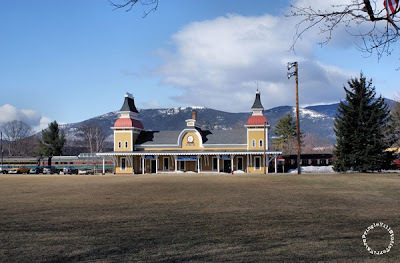 N. Conway is a town that's totally surrounded by the White Mountains. 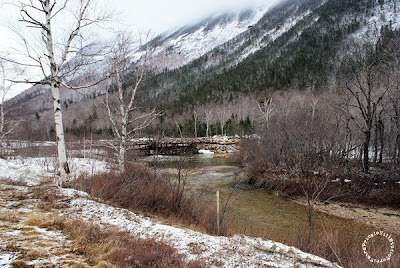 In warmer weather, you can take a ride through the mountains on the N. Conway scenic railway. 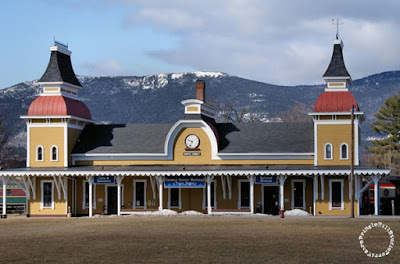 The Victorian station is beautifully maintained and very picturesque. If you blink as you're going through, you'll miss the entire town of Bath - it's very tiny! 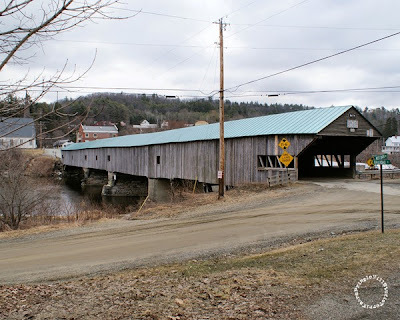 However, it does have a wonderful, old covered bridge. 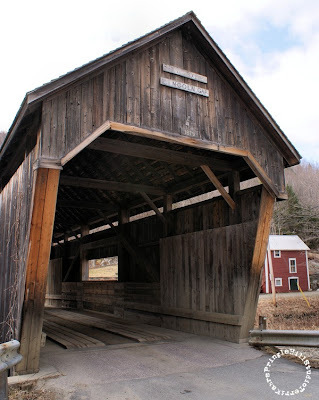 Built in 1832, it's one of the oldest covered bridges in America. 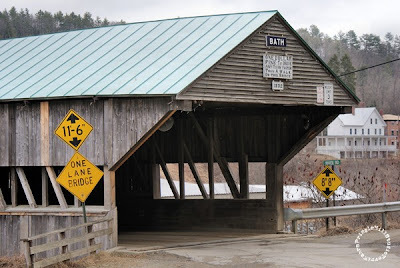 It's also the longest covered bridge in the State of New Hampshire. To romantics it's known as the "kiss 'n bridge". 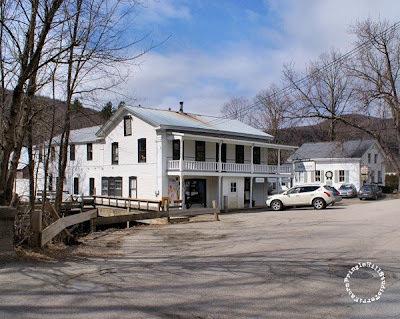 Warren, Vt Part of the Mad River Valley! 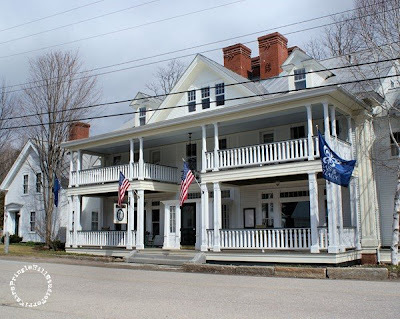 We discovered this enchanting New England town many years ago, and I fell head over heals in love with it! 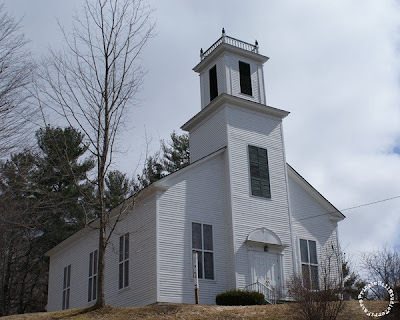 It boasts a church, a library, a tiny grocery/deli type store, a gallery and an inn. During warmer months, this town is a haven for visitors who enjoy hiking, biking and other mountain sports. 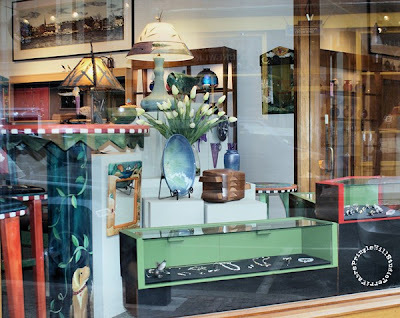 This is picture of the store with the gallery is to the right. The store is a great place to grab something for your journey. (Their baked goods are beyond yummy!!!) 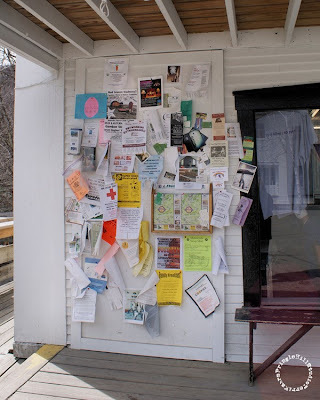 I love the old-fashioned way the local activity fliers are posted on the bulletin board! 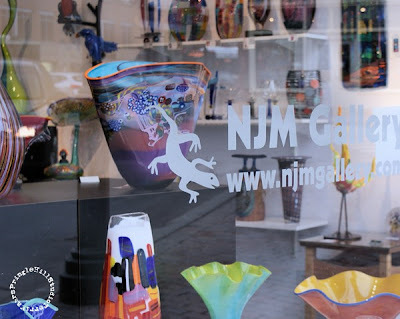 The gallery is a wonderful little shop filled with the local artist's creations. Located directly across the street from the store! 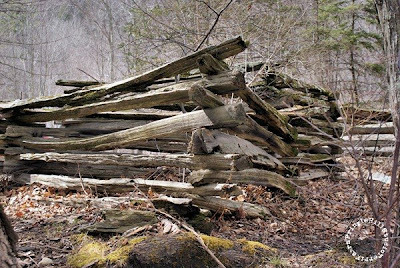 I love the texture of these old split-rail fences! This covered bridge is located on the outskirts of the village. We're leaving New Hampshire and heading to Woodstock, Vermont! 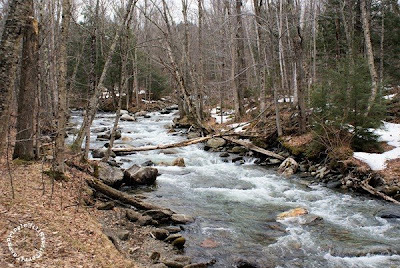 (Yes, there are two Woodstocks in New England!) Weaving our way through more mountains, we happened to come upon this gorgeous stream and a waterfall. I only wish there was a way to convey the sound, power and majesty of the waterfall. More pictures are in the works, so check back later! Thanks for coming along on the virtual tour! Eeeekkk! I'm having a ton of Blogger trouble this a.m. My "layout" section is frozen, and all of my wonderful followers have disappeared!!! I KNOW you're there, and I'm trying to get your "button" back. Yikes! Is anyone else having this problem? Last week we started our vacation with a drive to Portsmouth and arrived at dusk, just as all of the shops began to close for the evening. But it really didn't matter - we had a ton of fun "just looking"! 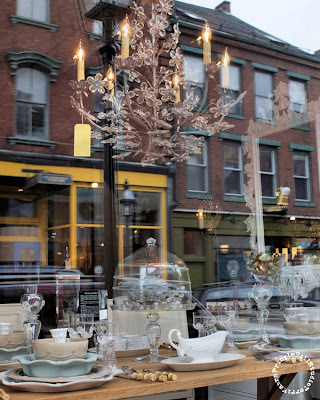 Come along on a virtual tour and window shop with me in downtown Portsmouth, NH! 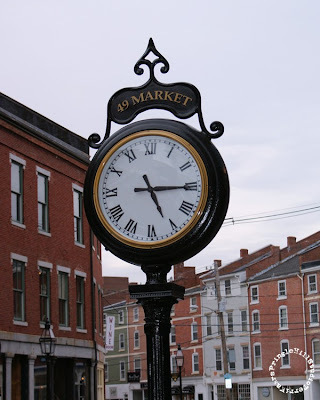 Portsmouth is a grand, old port town that has a lot of New England charm and architecture; and the city has maintained a young, vibrant identity. 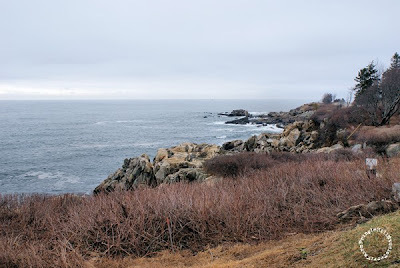 It's located directly across the border from Kittery, Maine. If you'd like a closer look - just click on each of the pictures and they'll open in a larger window. Enjoy! Although these galleries were getting ready to close, we did manage to sneak into one or two. I have great respect for glass artists. It's probably one medium that I'll never try; however, I DO love the colors and textures of contemporary pieces. The following pictures are very interesting because the old buildings across the street are reflected in the shop windows. When I took the pictures, I didn't realize that this had happened until I began to download. What a happy accident! 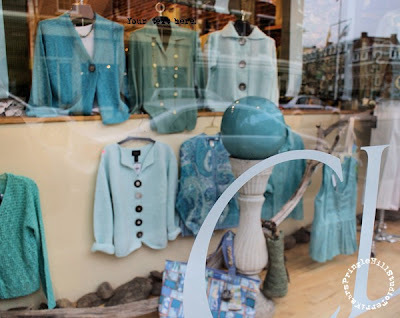 Such beautiful clothing in some of the shops. What an unexpected surprise! Who'd of thought you'd find such gorgeous-ness? 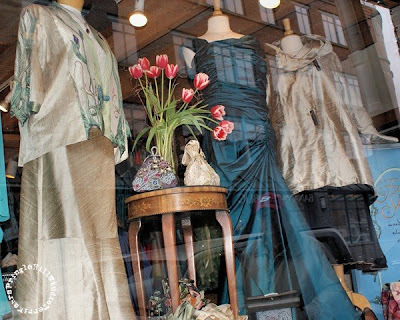 The dress shop was filled with one-of-a-kind silk and tulle party dresses, hand-beaded goodies and beautifully embroidered clothes. 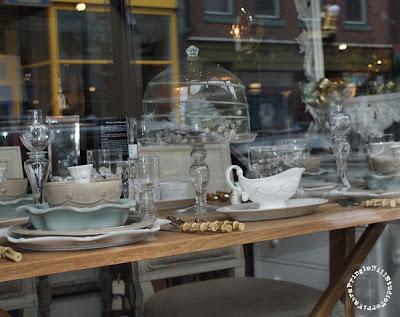 The owner goes on shopping trips to Europe to fill her shop with yummy things. I had to restrain myself from leaving drool puddles on the floor! I love these pretty sea-glass colors! 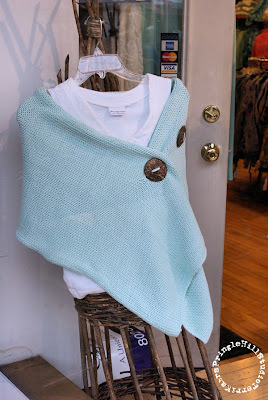 Each of these sweaters are hand knit and sport handmade buttons. 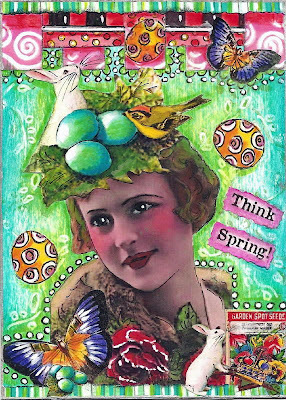 When Nancy posted this week's Crowabout images, I immediately thought of Spring wearing her Easter bonnet! Most of the ten images that I used were manipulated in a photo editing program for size only. The background was done with washes of thinned acrylic paint and overlays of watercolor pencils. The weathered look was created using a piece of sandpaper; and, the "vines" were drawn with a white poster paint pen, and the "leaves" were colored with Prismacolors. When the drawing was complete, the vines were lightly sanded for an aged appearance. Many of the images were over-colored with either watercolor pencils or Prismacolor pencils to enhance and deepen the original colors. 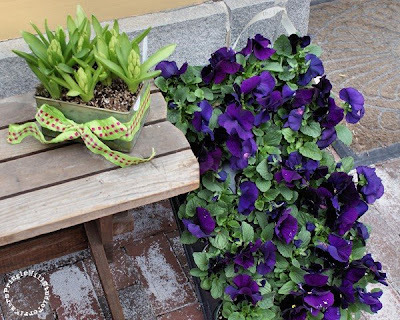 Thanks, Nancy, for this great springtime challenge! Congratulations! To my winners, please email your home address privately so that I can send your "surprise" when it's ready. You can do this by clicking on "View My Complete Profile" and then use the "Email" button located under the "Contact" title on my Blogger profile page. Once again, thanks to everyone for participating and Big "Woo-Hoo" Congrats to the Winners! This is a just a tiny portion of Marsha's original artwork. If you'd like to see the entire piece (and become pea-green with envy! ), click here to go to her FLICKR site or here to go to her blog. Thank you, Miss Marsha TumbleFish for this wonderful homecoming surprise and for your generosity and kindness. I'm very blessed to have you in my life. 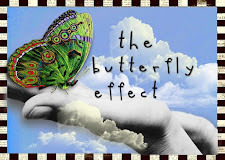 You must visit Marsha's blog when you have an opportunity. Her writing style is just as witty and colorful as her art. It's a blog that will make you smile. Personally, I think that Marsha is the Erma Bombeck of our art community! Once again, thank you, My Friend!